WOODRIDGE, NY [CHI] — A tragic one-vehicle accident upstate New York left one Bochur dead, and a seriously injured passenger after the driver apparently fell asleep at the wheel. The incident took place on Route 58, Glen Wild Road near Woodridge in Sullivan County, right across from the Skvere Camp Beis Yitzchok. Yeshiva World News reported that the Niftar is 19-year-old Yeshaya Dovid Eckstein OBM who lived on 8th Street in the Kensington section of Brooklyn. Yomtov Malek, a Hatzalah paramedic and coordinator, displays the uniform that will be worn by members of his organization. He was at a breakfast Sunday in Monticello with Sullivan County police and fire agencies. MONTICELLO, NY — Volunteer paramedics who wear long curling sideburns and black hats sat down Sunday with state agency representatives for breakfast and a side order of understanding. The goal: coordinate efforts for the summer when the population and emergency calls rise dramatically. S. FALLSBURG, NY — The Fallsburg fire chief has been arrested in connection with the August 29 arson of a bungalow at a Jewish summer camp in Sullivan County. FALLSBURG, NY — A Fallsburg man was charged with felony arson and hate crimes on Tuesday in connection with a bungalow fire and spray-painted slurs in his Sullivan county town. Town of Fallsburg Police said Edward Smith, 44, allegedly started a fire at Skopps Bungalows on Seldon Road and also spray painted slurs and threats. minivan to leave Sullivan County. WOODBOURNE, NY — Bakery workers scraped mounds of poppy seeds into trash bins. Fathers strapped luggage and toys to the roofs of minivans. Mothers were too busy hosing off chairs and folding the last of the laundry to talk about the exodus. This scene has repeated for decades now. The day before Labor Day, Sullivan County’s Hasidic Jewish communities pack up and vanish. Shops close, bungalows empty, summer ends. Many return to the bustle of Brooklyn. MONTICELLO, NY [CHI] — Three perpetrators were arrested following the beating of Lubavitcher Bochurim. Charged were William Harrison, 18, of Livingston Manor, Sean Gadsen, 16, of Youngsville, and Matthew Alcivar, 17, of Queens, and all three were charged with second-degree assault as a hate crime, gang assault in the second degree, aggravated harassment and disorderly conduct, they were arraigned and remanded to the Sullivan County Jail without bail. The incident took place on last week on Thursday night, beginning inside the Monticello Wal-Mart where the two groups first came into contact where racial slurs and taunts were shouted at the Bochurim, then in the parking lot into a assault where one of the Bochurim sustained fractures to his face. More pictures in the Extended Article. SOUTH FALLSBURG, NY — Fallsburg police removed anti-Semitic graffiti on Wednesday on a road in South Fallsburg. Police found swastikas and nooses drawn on Westwood Drive near summer bungalows where orthodox Jews vacation. “It was just somebody venting,” Chief Simmie Williams said. But Rabbi Yakov Barros said the matter should be investigated fully. ALBANY, NY — The New York State Thruway Authority and State Police Troop T Thursday announced that “Operation Summer Brake” will take place beginning Monday, August 25, 2008 through Friday, August 29. From August 25 through August 29, Members of State Police Troop T, dedicated solely to conducting speed and aggressive driving enforcement, will be deployed daily along the New York State Thruway. S. FALLSBURG, NY [CHI] – In the Catskill Mountains the nights grow cold and family’s in the Mei Menuchos (pleasant waters) Bungalow Colony gathered around a warm fire in a kumzitz, some baking potatoes and marshmallows and sharing stories of the Baal Shemtov. SOUTH FALLSBURG, NY — Police got a call Saturday afternoon about 3:00pm of a vehicle that rolled over a few times on Route 42 and crashed into a bungalow at Friendship Bungalow Colony on LaVista Drive. The car that missed a turn-off was driven by a drunk 16-year-old boy, who extracted himself out of the vehicle, and start running away, while Yiddish music was still blasting out of the vehicle. Hatzolah responded and was immediately on the scene. Police gave chase, caught up with the teenager and arrested him. RUNNING SPRINGS, CA [CHI] — Less than two months after the devastating California wild fires in Running Springs, Camp Gan Israel Running Springs is up and running. 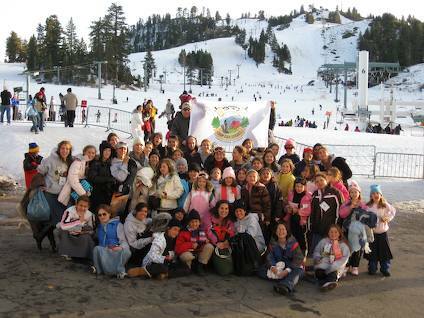 Children came from all over California and other Western states. The 6 day camp for the girls and 6 days for boys were highlighted by unforgettable unity Shabbatons, with additional children joining together in a true spirit of Achdus. Just two weeks after its installation, a median guardrail on Route 17 stopped a car from crossing over into oncoming traffic. “You can say it works, and that it saved a life today,” said state Trooper Jason Grabowski of the new guardrail installed near Exit 130. According to state police, the driver of a westbound white 2003 Chevrolet Cavalier bounced off the newly installed rail after the driver lost control trying to pass another car on its left. The car then came back onto the highway, flipped and came to rest upside down on the right shoulder of the road, police said. Slaotsburg, NY — Every summer there's an interesting sight on the New York State Thruway: dozens of men gathering to pray on public property in Sloatsburg. Which leads some to wonder, Is there more than meets the eye? And why are state officials concerned? Slaotsburg, NY — Every summer there’s an interesting sight on the New York State Thruway: dozens of men gathering to pray on public property in Sloatsburg. speed would not make the highway safer. Lowering the speed limit on Route 17 would not make the highway safer, according to an internal state Department of Transportation report. In fact, reducing the limit from 65 mph to 55 mph could reduce safety on the stretch of highway between the Town of Wallkill to the New York State Thruway. “If (the speed limit) was lowered, it might be more dangerous,” said Josh Ribakove, a DOT spokesman. Pleasant Stretch of Road Proves Deadly, but Why? Four people were killed in an accident on March 17, 2006, on the New York State Thruway south of Harriman. Officials are studying an unusually high number of crash fatalities on a 13-mile stretch of the highway. SLOATSBURG, NY — With the Ramapo Mountains forming a rugged backdrop, the stretch of New York State Thruway between Exit 15A and Exit 16 is a pleasant, mostly straight and altogether unremarkable ribbon of highway, looking every bit the prototypical interstate designed to take drivers quickly and safely from city to city. Orange County, NY — A state contractor is set to begin installing a metal barrier in the middle of Route 17 next month to prevent cars from crossing the grassy median and colliding with oncoming traffic. The Department of Transportation had planned to do the work in 2009 but moved up its schedule after a spate of deadly crossover crashes, including one in October in Chester that killed a young New York City couple and left their 10-month-old daughter an orphan. South Fallsburg, NY — The Town of Fallsburg remains the epicenter in Sullivan County for interest in developing and expanding bungalow colonies. Of the 14 items before the Planning Board Thursday night, 11 were related to the town's seasonal Orthodox Jewish community. If approved, they would add more than 600 new units with more than 3,000 new residents. The largest single project on the agenda was Walden Pond, a single and multifamily 350 town house development with 45,000 square feet of commercial space proposed for Woodbourne at Leins Road and Route 52. The Planning Board will send a letter to the Town Board that the developer has been “positively cooperating” with the planning process. The town has conditionally approved the rezoning to a half-acre. South Fallsburg, NY — The Town of Fallsburg remains the epicenter in Sullivan County for interest in developing and expanding bungalow colonies. Of the 14 items before the Planning Board Thursday night, 11 were related to the town’s seasonal Orthodox Jewish community. If approved, they would add more than 600 new units with more than 3,000 new residents.